A responsive, parallax build for one of the nation’s biggest retailers. 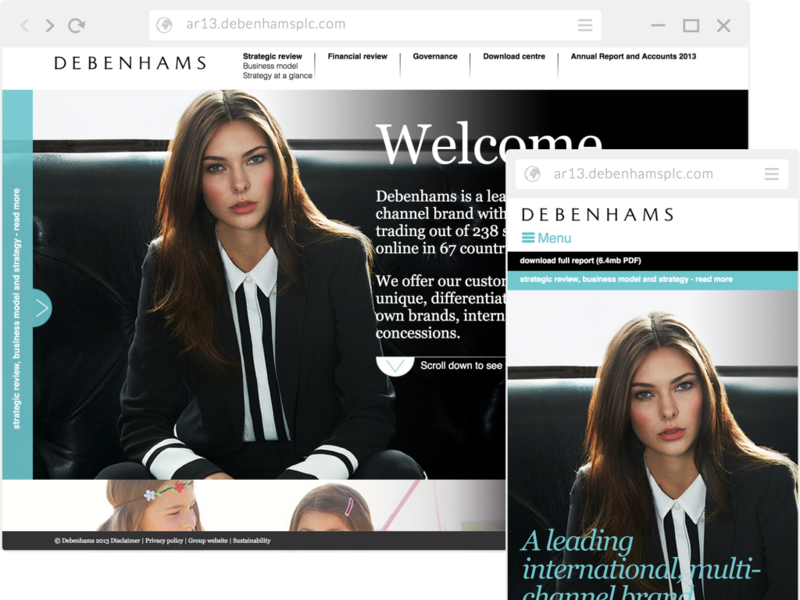 The latest in the series of Debenhams Annual Report allowed them to present their investment case in a fresh and engaging manner, it broke new ground in terms of best practise and innovative online production. The online report used a cost effective hybrid microsite to bring the key business strategies to life. The microsite and my role in the front-end markup demonstrates a good, thoughtful use of responsive website design stretching further than the standard ‘stacked’ solution. Visitors receive a seamless, unique experience down to the fine detail whatever the computer, device or operating system they opt to view the website on. Parallax, a technique to simulate motion where background images move at a differing rate than the foreground images or in association to other background images, was introduced to improve engagement & excitement, creating a sense of depth – the concept of storytelling. Parallax scrolling, if used in the right manor, can give your site a very unique look and feel and this website was a fantastic opportunity to demonstrate where parallax scrolling can be successfully implemented.